Please check this page regularly for HW assignments, handouts, study guides and more. Learning objective - The student will determine the surface area of prisms. Classwork - Warm-up, review & practice. Homework - Finish hyperdocs from last week. Learning objective - The student will determine the surface area of a pyramid. Classwork - Warm-up, lesson, practice. Learning objective - The student will review circles, composite area, surface area of prisms and pyramids. Classwork - Warm-up, review, practice. Homework - No homework. Review handout. QUIZ TOMORROW!! Learning objective - The student will demonstrate knowledge of circles, composite area, surface area of prisms and pyramids. Classwork - Warm-up, review, quiz. Learning objective - The student will hear about different careers from a variety of speakers. Homework - No homework - Have a great Spring Break!!!! Learning objective - The student will determine the perimeter of a composite figure. Classwork - Warm-up, explore composite figures, practice. Homework - Handout 8.2 #1. Homework - Handout 8.2 #2. Quiz tomorrow. Learning objective - The student will show knowledge of the parts of a circle, circumference and perimeter of composite figures. Learning objective - The student will review the parts of a circle and learn the formula for area of a circle. Classwork - Warm-up, review, area formula, start foldable. Homework - Finish circle foldable. Learning objective - The student will calculate the area of a circle. Classwork - Warm-up, lesson, practice, handout. Learning objective - The student will review angles, triangles, quadrilaterals and scale drawings. Classwork - Warm-up, review, practice test. Homework - Study for test. HERE IS THE STUDY GUIDE. Learning objective - The student will demonstrate knowledge of angles, triangles, quadrilaterals and scale drawings. Classwork - Warm-up, test, organize notebooks. Learning objective - The student will explore circles. Classwork - Warm-up, circle HyperDoc. Homework - Finish HyperDoc activity in Google Classroom. Learning objective - The student will know the parts of a circle and calculate circumference. Homework - Pages 321-323 #1, 3-11 odd, 18, 26-28. Complete in notebook then submit online at Bigideasmath.com. Learning objective - The student will complete test corrections for chapter 7 test. Classwork - Warm-up, go over test, work on corrections. Learning objective - The student will describe scale drawings and know a scale factor. Learning objective - The student will review angles and triangles. Classwork - Warm-up, quiz corrections, review. Homework - Finish quiz corrections. Learning objective - The student will explore scale drawings. SUB TODAY. 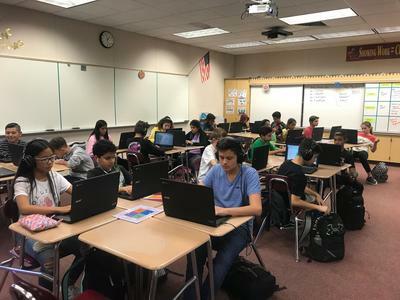 Classwork - Warm-up, Marcellus the Giant Activity - in Google Classroom. Classwork - Warm-up, review, whiteboard practice. Homework - Finish study guide. Classwork - Warm-up, go over study guide, start station review. Homework - Study for test. Test on Tuesday. Classwork - Warm-up, station activities. Homework - Review notes for quiz. QUIZ ON WEDNESDAY. Homework - Review notes for quiz. QUIZ TOMORROW. Learning objective - The student will demonstrate knowledge of angles and triangles. Classwork - Warm-up, quiz, organize notebook. Learning objective - The student will use geoboards to explore quadrilaterals. Classwork - Warm-up, activity, start mini-book. Homework - Finish mini-book: description and picture for each quadrilateral. Learning objective - The student will classify quadrilaterals and solve for a missing angle. Homework - Page 296-297 #1-3, 5-13odd, 14-24even. Complete in notebook then submit online at Bigideasmath.com. Learning objective - The student will identify adjacent, vertical and congruent angles. The student will use adjacent and vertical angles to find the value of x. Homework - Pg 274-275 #1-4, 5-13odd, 14, 18, 21-24. Complete in notebook then submit online at Bigideasmath.com. Learning objective - The student will classify complementary and supplementary angles. Learning objective - The student will review angles. Classwork - Warm-up, review and practice, start foldable. Homework - Finish foldable. On page 62 of notebook, write 3 questions about angles and their answers. Learning objective - The student will classify & construct triangles. Classwork - Warm-up, mingle activity, notes, practice. Homework - Page 64 of notebook: construction activity. Learning objective - The student will know the sum of interior angles of a triangle and be able to find a missing angle. 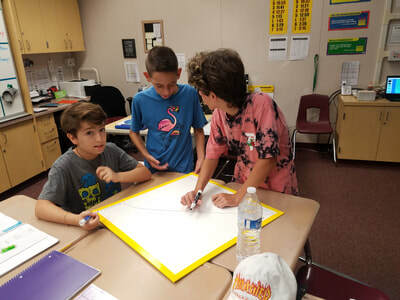 Classwork - Warm-up, triangle explorer activity, lesson, practice. Learning objective - The student will review calculating percentages, discounts, markups, percent change and simple interest. Classwork - Warm-up, test corrections, study guide. Learning objective - The student will review for benchmark test. Classwork - Warm-up, review and practice. Learning objective - The student will demonstrate knowledge of all topics studied this year. Homework - Glue in notes for the next unit. Homework - Study for test. Learning objective - The student will demonstrate knowledge of calculating percentages, discounts, markups, percent change and simple interest. Homework - No homework. Start benchmark review study guide #1-21. Homework - Work on benchmark review study guide #22-35. Learning objective - The student will investigate percent increase and percent decrease. Homework - 6.5 Page 244-245 #1, 8-11 & 32-36. Complete in notebook then submit online at Bigideasmath.com. Learning objective - The student will determine the at cost price for an item, the markup price and a discount price. Homework - Finish advertising poster. Learning objective - The student will investigate simple interest and associated vocabulary. Learning objective - The student will practice calculating markups and discounts. Learning objective - The student will calculate simple interest. Homework -6.7 Page 256-257 #1,2 4, 6, 13, 17, 21-25odd, 32-34. Learning objective - The student will solve percent problems using their choice of methods. Classwork - Warm-up, review and practice. Complete Big Ideas review. Homework - Study for quiz. Learning objective - The student will demonstrate knowledge of calculating percent. Classwork -Warm-up, quiz, organize notebook, start study guide questions 1-3 only. Homework - organize notebook. Start study guide questions 1-3 only. Learning objective - The student will investigate markups and markdowns. Homework - 6.6 Page 250-251 #1-3, 5, 7, 11-17odd, 20, 23 Complete in notebook then submit online at Bigideasmath.com. Learning objective - The student will complete quiz corrections. Classwork - Warm-up, quiz corrections and enrichment. Monday 1/14 - Bring new notebook today! Learning objective - The student will organize their notebooks for second semester. Classwork - Warm-up, organization of notebooks, review of fractions/decimal conversions. Homework - Finish organizing notebook as needed. Learning objective - The student will convert between fractions, decimals and percents. Classwork -Warm-up, lesson, practice, handout. Homework - Finish Handout. Include examples for each conversion. Learning objective - The student will compare and order fractions, decimals and percents. Homework - 6.2 Pages 224-225 #4-7, 16-17, 22-23, 33-36. Complete in notebook then submit online at Bigideasmath.com. Learning objective - The student will complete test corrections for proportional reasoning. Classwork - Warm-up, review test and work on corrections. Homework - Finish test corrections. Learning objective - The student will identify the part, whole and percent in a math question. Classwork - Warm-up, activity, letter to absent student. Homework - Finish letter to absent student. Learning objective - The student will review proportional reasoning. Homework - Finish quiz corrections. GET NEW NOTEBOOK BY FRIDAY. 8.5 x 11. Learning objective - The student will describe a direct variation. Homework - Handout. GET NEW NOTEBOOK BY FRIDAY. 8.5 x 11. Classwork - Warm-up, poster problem, work on study guide. Homework - Work on study guide. TEST FRIDAY! GET NEW NOTEBOOK BY FRIDAY. 8.5 x 11. Classwork - Warm-up, go over study guide, review game. Homework - Study for test. TEST TOMORROW! Learning objective - The student will demonstrate mastery of proportional reasoning. Classwork - Warm-up, test, organize new notebooks. Learning objective - The student will review graphs of proportional relationships and explore unit rate. Classwork - Warm-up, Desmos online activity. Learning objective - The student will explore multiple representations of proportional relationships. Classwork -Warm-up, finish project and present to class. Homework - Study for quiz. QUIZ TOMORROW! Learning objective - The student will examine a variety of strategies to solve proportions. Classwork - Warm-up, quiz, lesson, practice. Learning objective - The student will practice solving proportions using a variety of methods. Classwork - Warm-up, practice and discussion. Start handout. Homework - Gourmet Cooking handout. Learning objective - The student will explore rate of change via slope. Classwork - Warm-up, activity, handout. Homework - No homework. Have a wonderful winter break!!! Learning objective - The student will show knowledge of equations and inequalities. Learning objective - The student will identify a proportional relationship. Classwork -Warm-up, exploration, start paragraph. Learning objective - The student will identify proportional relationships. Learning objective - The student will identify & describe the graph of a proportional relationship. Homework - Letter to absent student. Classwork - Warm-up, lesson, start group project. Learning objective - The student will review solving inequalities. Classwork - Warm-up, go over study guide, 2 Wrongs & a Right, whiteboard practice. Homework - Study for tomorrow's test. TEST TOMORROW! Learning objective - The student will demonstrate knowledge of solving inequalities. Classwork -Warm-up, test, organize notebooks. Learning objective - The student will explore unit rate. Classwork - Warm-up, exploration activity. Homework - 5.1 Pages 167-169 #11-13, 17-19. Learning objective - The student will determine unit rates that include complex fractions. Homework - 5.1 Pages 167-169 #1-3, 14, 20, 23, 24, 27, 28, 30-33. Learning objective - The student will review their chapter 4 test and identify errors. Classwork - Warm-up, test corrections. Learning objective - The student will solve inequalities with addition & subtraction. Classwork - Warm-up, review, lesson, practice. Homework - 4.2 Page 134-135 # 1, 2, 7-13 odd, 20-22, 29-33. Mini-Quiz tomorrow! Learning objective - The student will explore how multiplication and division by a negative number impacts the inequality sign. Homework - Finish your letter to absent student: Your friend was absent from class today. Explain to them when they need to reverse the inequality sign. Learning objective - The student will solve inequalities by multiplication division. Homework - 4.3 Pages 143-144 # 1-3, 11-23 odd, 24-32 even. Learning objective - The student will solve 2-step inequalities. Learning objective - The student will justify their thinking while writing and solving inequalities. Classwork - Warm-up, practice, start unit guide. Homework - Start working on unit guide. Test next Tuesday! Learning objective - The student will correct chapter 3 tests. Classwork -Warm-up, start test corrections, vocabulary activity. Homework - Finish test corrections if not completed in class. Learning objective - The student will review integers, rational numbers, expressions, equations or be introduced to inequalities. Classwork - Warm-up, review activity. Homework - Review your notes. Benchmark test tomorrow or Friday. Learning objective - The student will write and graph inequalities. Homework - 4.1 Page 128-129 #1, 4, 5, 8-20 even, 21-25 odd. Learning objective - The student will solve an inequality with addition or subtraction. Homework - No homework - Have a great Thanksgiving Break!! Learning objective - The student will review adding/subtracting linear expressions, factoring & solving equations. Classwork - Warm-up, review activities. Homework - Study for tomorrow's test. Learning objective - The student will show mastery of adding/subtracting linear expressions, factoring & solving equations. Classwork -Warm-up, test, start review sheet. Homework - Look over the benchmark review sheet and pick a section to focus on. Learning objective - The student will review integers, rational numbers, expressions & equations. Learning objective - The student will show knowledge of integers, rational numbers, expressions and equations. Classwork - Benchmark test, glue in handouts for chapter 4. Learning objective - The student will review writing and solving 1-step equations. Homework - Work on study guide for 15 minutes or so. Learning objective - The student will solve 2-step equations. Homework - 3.5 Pages 112-113 #1-5, 13-25 odd, 28, 32, 34. Complete in notebook then submit online at Bigideasmath.com. Learning objective - The student will practice solving 2-step equations. Classwork - Warm-up, gallery walk activity. Learning objective - The student will review solving 2-step equations. Classwork - Warm-up, Poster Problem Activity, work on study guide. Homework - Finish study guide. If possible, bring earbuds tomorrow. Classwork - Warm-up, Desmos review activity. Homework - Test next Tuesday!! Learning objective - The student will review like terms, adding/subtracting linear expressions, and factoring. Classwork - Warm-up, review, writing. Homework - Finish writing, study for quiz. QUIZ TOMORROW! Learning objective - The student will demonstrate knowledge of like terms, adding/subtracting linear expressions, and factoring. Classwork -Warm-up, quiz, start review sheet. Learning objective - The student will solve equations with addition and subtraction. Homework - 3.3 Pages 100-101 #1-8, 15, 17, 22-28 even, 31. Complete in notebook then submit online at Bigideasmath.com. Learning objective - The student will solve equations with multiplication and division. Homework - 3.4 Pages 106-107 #1-14, 28. Complete in notebook then submit online at Bigideasmath.com. Learning objective - The student will review their quiz and make corrections. Classwork - Warm-up, corrections, activity. 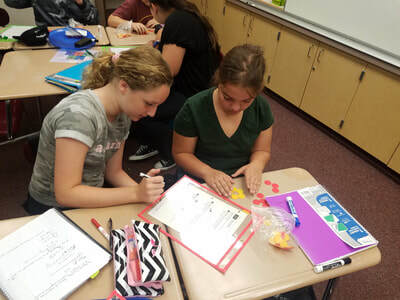 Learning objective - The student will use algebra tiles to practice adding and subtracting linear expressions. Classwork - Warm-up, activity, practice. Learning objective - The student will add and subtract linear expressions. Homework - 3.2 Page 90-91 #4 and 9-25odd. Complete in notebook then submit online at Bigideasmath.com. Learning objective - The student will practice adding and subtracting linear expressions. Classwork - Warm-up, whiteboard review, start handout. Learning objective - The student will factor an expression. Homework - 3.2 Extension. Page 93 #1-12. Complete in notebook then submit online at Bigideasmath.com. Learning objective - The student will review like terms, adding/subtracting linear expressions and factoring. Homework - No homework. QUIZ ON TUESDAY. Learning objective - The student will review operations with integers and rational numbers. Homework - Study for test. TEST TOMORROW!! Learning objective - The student will show mastery of operations with integers and rational numbers. Classwork -Warm-up, test, organize notebook. Learning objective - The student will identify like terms and combine like terms. Classwork - Warm-up, vocabulary review, lesson, practice. Homework - 3.1 Lesson Page 84-85 #2, 4, 7-9, 12-20even, 23, 25. Complete in notebook then submit online at Bigideasmath.com. Learning objective - The student will practice combining like terms. Classwork - Warm-up, card activity. Homework - Finish card activity. Learning objective - The student will their test from Friday and complete corrections. Classwork - Warm-up, test corrections, review activity. Learning objective - The student will divide integers. Homework - Pages 32-33 #1-7 & 17-31 odd. Complete in notebook then submit online at Bigideasmath.com. Learning objective - The student will apply rules for multiplying and dividing integers to rational numbers. Homework - Pg 68 & 69 #1-4, 8-12even, 16, 17. Complete in notebook then submit online at Bigideasmath.com. Learning objective - The student will practice applying rules for multiplying and dividing integers to rational numbers. Classwork - Warm-up, review and practice, start handout. Learning objective - The student review absolute value and all operations with integers and rational numbers. Classwork - Warm-up, station review day 1. Homework - Work on study guide. TEST NEXT TUESDAY!!! Classwork - Warm-up, station review day 2. Learning objective - The student will practice writing in Math. Classwork - Warm-up, paragraph reconstruction strategy, writing, practice. Homework - Review for tomorrow's quiz. QUIZ TOMORROW. Learning objective - The student will show knowledge of adding & subtracting integers & rational numbers, absolute value and converting between decimals & fractions. Classwork -Warm-up, quiz, read silently. Homework - No homework. Work on any missing assignments. Learning objective - The student will explore multiplication of integers. Classwork - Warm-up, guess the pattern, activities. Homework - Pages 26 & 27 #8-15 & 49-52. Complete in notebook then submit online at Bigideasmath.com. Learning objective - The student will multiply integers. Homework - Pages 26 & 27 #1-7 odd, 20-23, 30-34 even, 39, 40, 45, 46. Complete in notebook then submit online at Bigideasmath.com. Learning objective - The student will review adding, subtracting, and multiplying integers. Classwork - Warm-up, Quiz Corrections & review. Homework - Finish quiz corrections if not completed in class. Learning objective - The student will add rational numbers. Homework - Page 54-55 # 1-3, 7-15, 19, 21, 24. Complete in notebook then submit online at Bigideasmath.com. QUIZ TOMORROW. Learning objective - The student will show knowledge of absolute value, adding integers, adding rational numbers, and converting between fractions & decimals. Classwork -Warm-up, quiz, glue in note sheets. Homework - Glue in note sheets. Learning objective - The student will subtract integers. Classwork - Warm-up, notice & wonder, lesson, practice. Homework - Pages 18 & 19 # 5-15 odd, 20-26 even, 27, 28, 39, 40, 44. Complete in notebook then submit online at Bigideasmath.com. Learning objective - The student will subtract rational numbers. Homework - Pages 62 &63 #1, 3-5, 9-13, 16, 18, 19, 23, 24. Complete in notebook then submit online at Bigideasmath.com. Learning objective - The student will review adding and subtracting integers. Homework - Finish quiz corrections if not completed in class. Quiz next Tuesday. Learning objective - The student will explore negative numbers. Classwork - Warm-up, explore integers, real world situations. Tuesday 9/11 - WEAR RED, WHITE, & BLUE today! Learning objective - The student will know that absolute value is the distance from zero and it is always positive. Classwork -Warm-up, lesson, practice, start homework. Homework - Page 6 & 7 #4-11, 21, 25, 26, 30, 38, 42. Complete in notebook then submit online at Bigideasmath.com. Learning objective - The student will use models to determine if the sum of 2 integers is positive, negative, or zero. Classwork - Warm-up, explore activities, start homework. Homework - Page 12 & 13 #8-15 & 50-54. Complete in notebook then submit online at Bigideasmath.com. Learning objective - The student will add integers without the use of a model. Classwork - Warm-up, lesson, practice, start homework. Homework - Page 12 & 13 #1-7, 21-27odd, 36-42even. Complete in notebook then submit online at Bigideasmath.com. Learning objective - The student will review converting between fractions/decimals, absolute value, and adding integers. Classwork - Warm-up, Desmos and online review. Homework - No homework. Quiz next Tuesday. Monday 9/3 - No School Today! Learning objective - The student show knowledge of basic math skills. Learning objective - The student will be introduced to the growth mindset. Classwork - Warm-up, HyperDoc Activity. Learning objective - The student will organize their math notebooks. 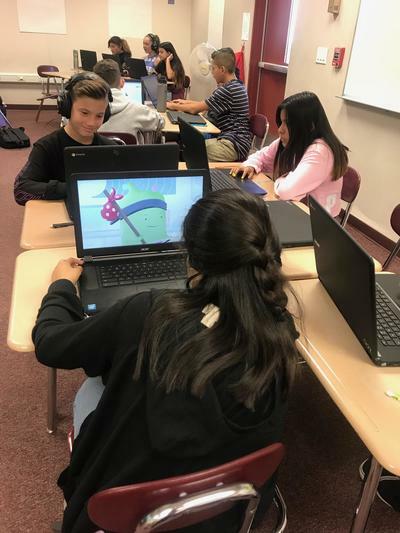 Classwork - Warm-up, organize notebooks, finish Growth Mindset HyperDoc Activity. Homework - Finish Growth Mindset HyperDoc Activity (located in Google Classroom). Learning objective - The student will convert between fractions and decimals. Classwork - Warm-up, notes, practice. Homework - Page 43 #1-4. Complete in notebook then submit online at Bigideasmath.com. Monday 8/27 - No School Today! Learning objective - The student will know classroom procedures and routines. Classwork - Index card activity, introduction to the physical classroom, routines & expectations. Learning objective - The student will review classroom procedures and routines. Classwork - Get seat assignment, review routines & expectations. Learning objective - The student will demonstrate knowledge of classroom procedures and routines. Classwork - Warm-up, quick review, procedure quiz, join Google Classroom, explore textbook website. Friday 8/31 - No School Today!